Happy Monday Foxy Friends! The last TBB asks was such a success that we decided to make it a monthly thing! Join up with us the first Monday of the month, find the questions on social media or our blog for the next month. Easy post if you ask me. I'm all about easy and not having to think too much or too hard! So here are this months questions. 1. Pool, Lake or Ocean? Oh touch choice...I love the ocean when you get the beach to yourself, otherwise pool! 2. Camping, cottage or hotel? I love camping, but ask me again after Yosemite with two kids 6 and 3, haha! So let's go with hotel since it's been 8 years since the last camping trip. 3. Favorite Ice Cream Flavor? Chocolate Malted Crunch from Thrifty, if that isn't available then any chocolate/peanut butter combo. 4. PJ's, Nightgown, T-shirt/Shorts or Birthday Suit? PJ's. I like shorts/pants and a top. Nightgowns tend to get all twisted up. 5. Fave Summer Beverage? I'm so bad, but Diet Squirt, I love it so much. But I have really been into Robert Mondavi, Flume Blanc 2014, so dang good. If you like a good white wine, this is going to be your best friend. 6. Would you rather be hot or cold? Cold, you can always add layers, you can only take off so many. 7. Sandals with heels or flats? I love heels, mostly because I'm short, if I didn't have to walk so much at work, I would wear them everyday. 8. Shorts or skirts? Skirts, I like how flowy and free you are. 9. Sit in the sun or shade? Shade, always the shade, goes back to #6, I don't want to be hot. 11. Fave summer fruit, vegetable? Give me all the berries. My favorite combo is cut up strawberries and green grapes, put both in mouth at same time, my favorite. Although I love a good corn on the cob. Too many decisions, I love it all. 12. Sunrise or Sunset? Sunrise. I hate to say it, but I see the sunrise from my office every single workday and it's always breathtaking. 13. Bike Ride or Walk? Bike ride, you get to see so much more that way. Bike riding in the hills of Tuscany was amazing. 14. Winery or brewery? I've never been to a brewery, to beer taste, I've been to eat the food, but didn't do the beer tasting part, so I'm going to have to say Winery. 15. Garden or no garden? No garden, although if someone could plant, water, prune and sustain for me, that would be great, I have a black thumb and kill anything just looking at it. 16. Big summer concert or music in the park? Music in the park, there are so many talented people out there to listen to. 17. Fave cookout food? Steak, corn on the cob and baked potato (but that happens in the oven). 18. Dine indoors or patio? Patio, we don't get many bugs where I live, so we can sit outside all day long, it's the best. 19. Fave summer destination? Oh this one is hard...can I pick hanging with friends? Usually we have plans with friends and we get to do so many things because of it. 20. Big theme park or local carnival? Theme park, I don't raelly like local carnivals because typically they are in dirty dusty places which really gets my allergies going. 22. Posicle or freezie flavor of choice? Popsicle, strawberry flavor. 23. Hot Dog or Hamburger? Hamburger, yum. Alright that's how I answered them, now you answer one of them! 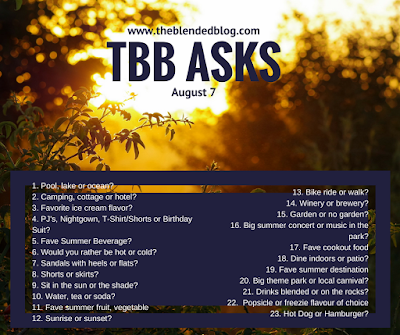 Go check out how the other ladies of The Blended Blog answered. Or link up below with how you answered!